Good news for Northern Line travellers who were facing a summer of early closures throughout the summer. The Bank and High Barnet branches of the line were due to shut at about 9.30pm BST on Mondays to Thursdays from next week. However, TfL has decided to revert to a normal schedule now all of its maintenance work has been brought back in-house. London Underground's MD, Mike Brown, said "London Underground is working with Tube Lines to review the upgrade and hence we are cancelling the immediate early-evening closures planned". He added they were looking for a plan "that gets the job done to a timetable that suits Londoners, and with the minimum disruption to our customers and businesses". Small businesses in the area believed that work would force some night time retailers to close. No announcement has yet been made on how the 40 year old signalling system will be upgraded, but TfL have promised to be "engaging fully with the business community" and listening to traders' (and hopefully commuters) views. Wonder if the traders on the Hammersmith & City Line and Circle Lines will have such good news? Currently they're expecting are expecting a dramatic slump in business from July 24 to August 15. Work is taking place to remove a disused taxi ramp and canopy at Paddington and will have a knock on effect, with no trains running between Hammersmith and Edgware Road for three weeks. A TfL spokesman has already apologised for the inconvenience and said: "We will shortly be commencing a publicity campaign to inform passengers, residents and businesses about the alternative travel options. There is no other option than to close this section of line however it is planned to coincide with the start of the school holidays when the Tube will be less busy." 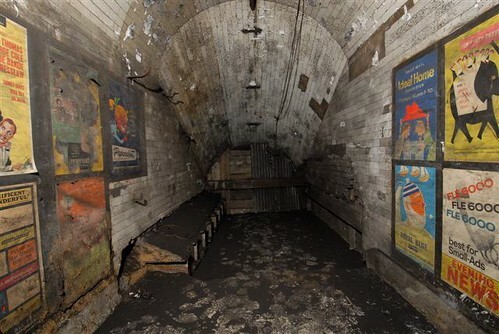 You'll be able to see some of the disused Aldwych London Underground station for the next two weeks. However, it's only the ticket hall, as it will be displaying a special free exhibition - "Transforming the Tube". The exhibition will run from today Monday 28 June until Friday 9 July from 10:00 to 19:00 on weekdays and 10.00 to 16:00 on the weekend. The entrance to the exhibition is on Surrey Street, WC2R 2NE, which is off the Strand and off Temple Place. Temple is the nearest Tube for this. 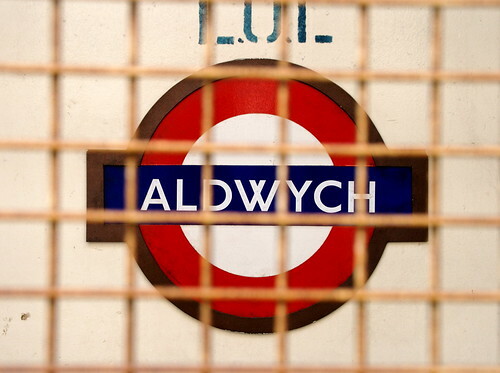 Aldwych station has been closed for the last 16 years, but is occasionally opened for private parties and corporate events. Maybe this is a small sign that TfL are receptive to putting closed stations to other uses. Wonder when the W changed from that font in the picture? Update - Londonstuff went along on the first day and has pictures and videos here. 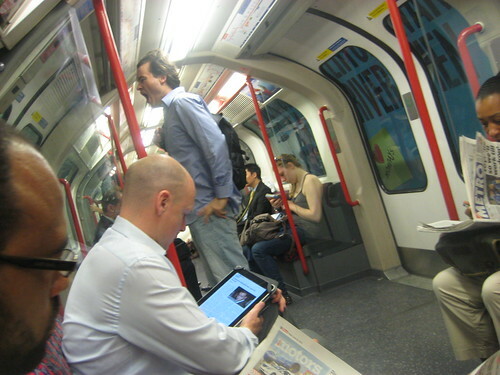 Like buses, you wait ages to see someone using an iPad on the London Underground, then along come several. Well, two! iPads still have that "ooh" factor when someone takes one out and up until now, I've never seen one being used on the Tube. Yesterday, I saw my first and then this morning my second, pictured below. 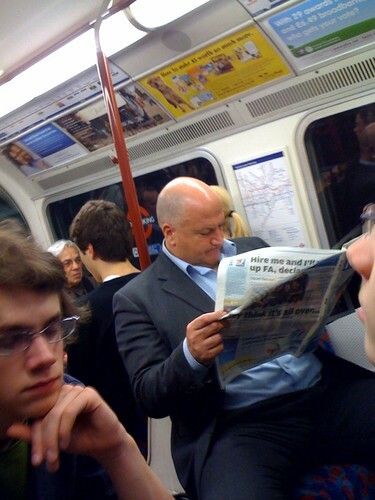 The Tube's normally a good place to spot early adopters of new technology. The guy pictured above on the Central Line was reading The Times (which looked remarkably sharp even from where I was sitting). The man yesterday had his propped up in its holder and was typing an email. I'll probably see loads of them now that I've broken my duck. Gradually they'll become common place. But for the moment, I wonder if more people are carrying them around and just worried about having them on display while commuting? Have you seen anyone using one on the Tube or any other public transport? Commuters on the subway in Berlin were offered the choice of stairs, escalators or a giant slide to get down to the trains. I'm surprised how many actually chose the slide - although it does look fun! Before health & safety officials get up in arms, it was only a promo for VW and it's not going to be installed any time soon. Hat tip to Neil Turner for showing me this. Wonder what would happen if they carried out the same test on the London Underground? It's energy efficient, fun and could certainly speed up the flow of passengers walking down stairs. Perhaps there could even be a twisting one at Covent Garden Tube. It might actually make going down the 193 steps there a viable option, rather than waiting for the lifts! Last minute legal action begins this morning to halt the 48 hour strike due to take place with Tube Lines maintenance staff. The potential strike is due to disrupt three of the busiest London Underground Lines, the Northern, Jubilee and Piccadilly from 7pm this evening, 23rd June. However, the contractor, Tube Lines, is going to the High Court to challenge the legality. RMT leader Bob Crow is undeterred and said "Despite this legal challenge, the 48-hour strike remains on. "RMT will defend its position in the court against this latest attempt by an employer to use the full force of the anti-trade union laws to override a perfectly bona fide ballot." In the meantime, a planned 72-hour strike by RMT members on the DLR from 4am today was called off following a new pay offer. Watch out for news reports on the result of the court action later today. However, even if the strike takes place, London Underground states it "intends to operate a full service to customers across the whole of the network, including on the Jubilee, Northern and Piccadilly lines, throughout the duration of the strike and all stations will remain open." Update - The Tube strike remains in place as the High Court refused to grant an injunction to prevent the stoppage. Mr Justice Tugendhat said he had reached a "clear view" that he should not grant an injunction but gave no immediate reasons for his decision. Bob Crow, said: "This is a massive victory, not only for the RMT and our members, but for every group of workers who stand and fight against job cuts and attacks on working conditions. "The strike goes ahead and will be solidly supported. We expect major disruption across the network." However, they will all be returning to court on July 9 for a one-day hearing to fully consider whether to grant an injunction ahead of the next planned strike on July 14. TfL are still confident in running a full service between this evening and Friday 7pm, and said "The action does not involve London Underground employees, including station workers and Tube drivers". No sooner than TfL have opened up their API with no restrictions, some clever developers have got to work to make a real-time Tube Map, showing all the trains on the London Underground network. The yellow pins are stations and the red ones are trains moving in approximate real time. The map was built over a weekend at Science Hack Day, by Matthew Somerville with the help of Frances Berriman and James Aylett. Hat tip to @benmason and @michald for letting me know. If people can build tools like this this in a few hours, it certainly bodes well for future apps, now that the data is freely available. As Matthew says "Woo, thanks TfL! Now how about it, National Rail? Open train data is good for everyone." 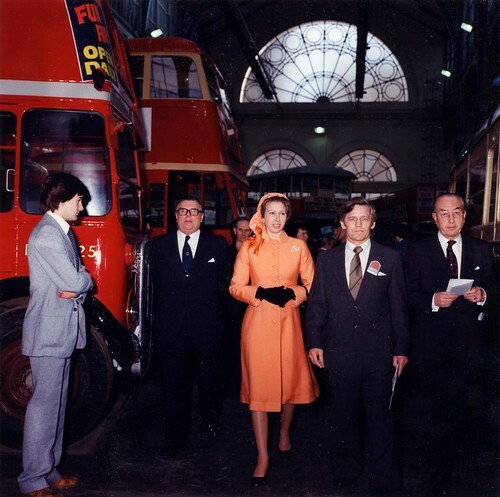 Thirty years ago London Transport Museum was opened by Princess Anne and this weekend, if you're an early bird, you can gain a 1980's entrance price. The first 15 guests on Saturday 19th June and the first 15 on Sunday 20th June can gain entry into the Museum for just £1.40 - the price in 1980. There's also a limited number of Bruce Rowling ‘Museum sketchbook – picturing our project’ books being given away to lucky visitors while stocks last. 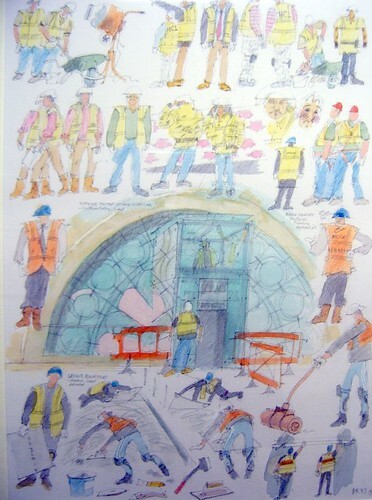 The sketchbook has a collection of wonderful illustrations of the plans for the Museum when it was clsoed for two year for refurbishment & re-opened in November 2007. London Transport Museum opens at 10am at the weekends and standard admission is £8. If you can get your Dad there early it might be a nice treat for him (or persuade your kids to take you there) for Father's Day. There's a new exhibition - Overground Uncovered: Life along the line - which celebrates the new East London, London Overground line. 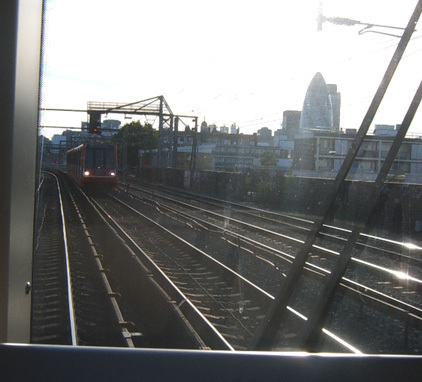 The line is London's first major public transport development for over ten years and connects Dalston Junction with New Cross, New Cross Gate, Crystal Palace and West Croydon. For nostalgic bus fans, London Transport Museum's 1950s prototype Routemaster bus RM1 will be on the Covent Garden Piazza in front of the Museum from 11am Saturday 19 and Sunday 20 June. The bus will be open to the public to view and climb on board. 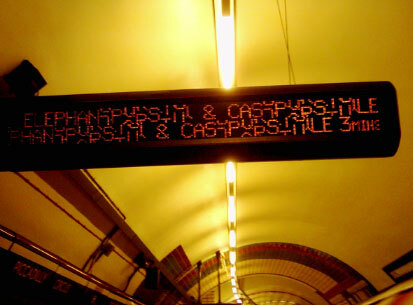 Full details of the birthday activities are on London Transport Musuem's site including a birthday Tweet competition. Catch up with their Twitter account over the past week to enter. "With the recent decision to bring Tube Lines under the control of Transport for London, this is the time to switch to a completely driverless train network." Naturally RMT leader, Bob Crow has responded quickly and said: "What will happen in a terrorist attack, a derailment or a massive signal failure, is you could have 600 or 700 people trapped down the Tube with no driver - there would be utmost panic. "I don't think the travelling public will put up with that. "Under normal circumstances I would be tempted to dismiss this leaked report as some kind of a joke, cooked up by anti-union fantasists, but in the current climate of cuts and attacks on public services we are taking it very seriously and it will be resisted. "It may well be that some junior politician is simply flying a kite to make a name for themselves, but RMT will not sit back and allow this lethal and unworkable idea to gain any traction whatsoever." It does appear that this memo was purposely designed to wind up Crow, as even though the Victoria and Central lines are automatically operated, there is always a train operator in the cab. A TfL spokesperson said "Having a member of London Underground staff on a train helps give reassurance to passengers, ensures prompt opening and closing of doors, speedy boarding and alighting of passengers and departure of the train." Don't forget, unless any discussions happen, we've got the first of two 48 hour Tube strikes starting next week on Wednesday 23rd June 2010 and running until 18.59 on Friday 25th June 2010. It's with Tube Lines so should only seriously impact the Piccadilly, Northern and Jubilee Lines. However, the RMT say the strikes will have "severe consequences" across the entire London Underground system. 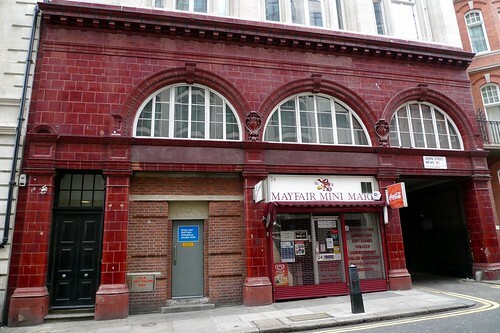 Reopening Disused Tube Stations - a step closer? There's a strong interest in uncovering the past on the London Underground. The walking tours of Brunel's Thames Tunnel were extremely popular and over-subscribed. Last month, vintage ads from the 1950's discovered at Notting Hill Tube received tens of thousands of views and excited blog posts. Now, Ajit Chambers from the Old London Underground Company may be getting step further to his mission to re-open 26 old abandoned Tube stations. I first blogged about his aim in September 2009, when he said his plans had been "warmly accepted" by the Mayor. Since then he's progressed some more as Dave Hill wrote on his blog for The Guardian yesterday. Possibly hoping that Chambers would go away, Boris Johnson and his economics director Anthony Browne encountered him in an audience for small businesses. Chambers said "I met with Anthony and Boris a year ago to let you know that I designed a company that will make £40 million for London. The company has now been built, we have found funders; we are using the same engineering teams that are building Crossrail to open these stations up as tourist attractions and venues. I would like your help to get into the first three venues as soon as possible." He'd spoken to a health & safety consultancy that works for the Tube. He has an investor who's prepared to put half a million quid into the business. He claims there's a business model to turn the disused and abandoned stations into tourist attractions and venues for corporate events. Johnson asked "Are we saying that the consortia that you can put together, they will cover the cost of remediating the stations and doing them up and making them compliant?" Chambers said it was and that "I am in contact with Coca Cola and Vodafone's Head of Communications, and the Olympic Portfolio Director in order to pour in that cash tax-efficiently. Also, it means that the government can lease these sites to me and still make money for TfL from them". Anthony Browne agreed to follow up the ideas and Chambers has a meeting set up with the Mayor's office in the next couple of weeks. Peter Watt (formerly of TimeOut) met Chambers last year and testifies to his determination. He wrote yesterday "I hope he succeeds. Londoners have a tremendous thirst for the mysterious parts of the city that lie beneath their feet – the weekend opening of Brunel’s Thames Tunnel earlier this year proved to be extraordinarily popular – and a dedicated museum to Subterranean London would be possibly the most exciting to happen in this city ever (although I may be biased in this view)." I'm not sure I'd go quite that far, but know it would be extremely popular. Watt believes Chambers has the will to succeed with this venture: "Chambers is determined, as Boris and Browne are soon to discover, and I would never bet against him. 'I’m not going to give up,' he told me. 'There’s no stopping me. And as soon as people realise that they seem to come on board pretty quickly.'" As I said last year, I wish Ajit Chambers every success and will be following his progress with great interest. There's going to be a lot of happy developers today, as TfL have announced they are lifting all restrictions on the commercial reuse of their data. Hopefully this means that travellers will see a lot of new creative apps (including mobile tube apps) to help us get around London. "TfL accepts the developers need to recover their costs and derive a return from their time in creating new applications. "This move will ensure that developers will be able to produce products independently and provide customers with a wide range of up-to-date applications and services.'" 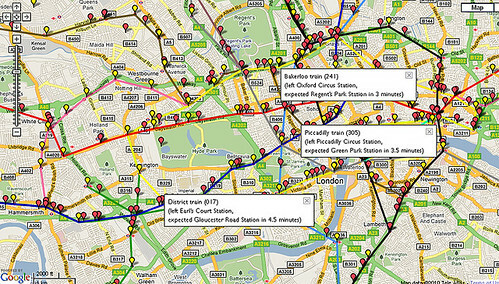 By using TfL's Developers' Area web developers can get hold of a number of data sets and feeds to live London Underground/Tube travel news on London's Datastore. Information on bus routes, bus stops and data from London Underground's Rolling Origin and Destination Survey will be added by the end of June. 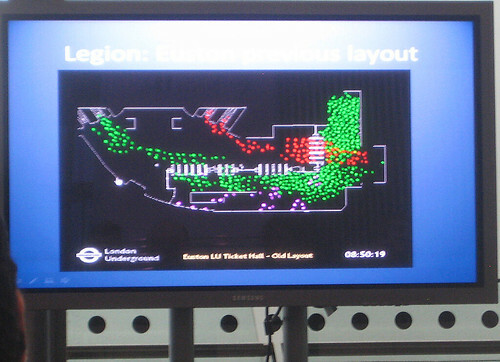 The London Datastore currently hosts travel-related data sets including: Station Locations, Oyster Ticket Stop Locations, London Underground Signals Passed at Danger (SPADs), TfL Investment Programme and TfL Business Plan. They said: "We welcome your feedback so let us know your priority datasets and don’t forget to follow @londondatastore (on Twitter) to keep up with alerts of further datasets to follow." Travellers on the London Overground were "treated" to every single announcement possible on their journey last week. Vinylpimpuk took "the London Overground on 5th June from Hackney Wick to Camden, and the voice on the train decided to announce everything it was ever told to say. This is after 4 months of closure for engineering works!" Goodness knows why the driver couldn't turn these off, or at least turn the volume down. Unless he or she wanted to "celebrate" travelling after closure, with TfL's version of the World Cup's vuvuzela! Thanks to Daniel N for sending this to me! Eagle eyed photographer Ian spotted a reason why the Northern Line should no longer be called the Misery Line. He said "A train indicator at Waterloo London Underground station reveals high level intervention on the Northern line!" Now that's an example of premiere service! Unless it's referring to the upcoming Tube strike which will affect the Northern Line and we'll need God's help to get through the days. If you see any more misbehaving train indicators please take a picture & send them my way. For those looking for the Tube Strike Dates for November 2010 onwards. Following the 90% majority vote for Tube walk outs, two dates have been announced for strikes by Tube Lines maintenance workers. Staff will not report for work between 19.00 hours on Wednesday 23rd June 2010 and 18.59 on Friday 25th June 2010. The second strike will be from 19.00 hours on Wednesday 14th July to 18.59 hours on Friday 16th July. Although Tube Lines only covers the Piccadilly, Northern and Jubilee Lines, the RMT say the strikes will have "severe consequences" across the entire London Underground system. 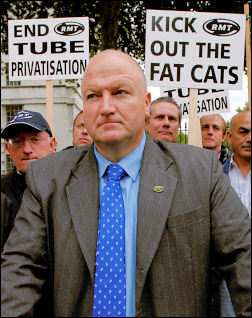 RMT leader Bob Crow said "We have given TfL, and their newly-acquired subsidiary Tube Lines, plenty of opportunity to give us assurances that staff won't take the hit for the failure of the privatisation project. "They have failed to give us those assurances, leaving us with absolutely no option but to announce these strike dates to protect both our members and the safety of the travelling public." Good news if you support Brazil, New Zealand, Paraguay, Slovakia, Italy, Portugal, Ivory Coast and Korea as they're all playing afternoon matches in the World Cup on the 24th and 25th June! You might be able to use it as an excuse to "work from home". As yet Transport for London have made no comment on the proposed strikes. RBob Crow said: "Our members will not be bullied by management into taking on more work without being properly compensated." The DLR members work for Serco, which called their demand "opportunistic"
Update 23rd June 2010 - the DLR strike has been called off and Tube Lines are going to the High Court to challenge the legality of the Tube strike. Do you feel we need more signs on the London Underground which tell people how to get on and off trains? You'd think it would be simple, but when crowds are concerned, there are still some travellers that have no idea about letting people off the Tube first before they get in. Toronto newspaper The National Post is also tired of this behaviour on the subway. They've produced a brilliant poster which they encourage people to follow and print. "We here at the Toronto Transit Civility Commission are firm believers in foresight and its necessity in keeping the system running smoothly. 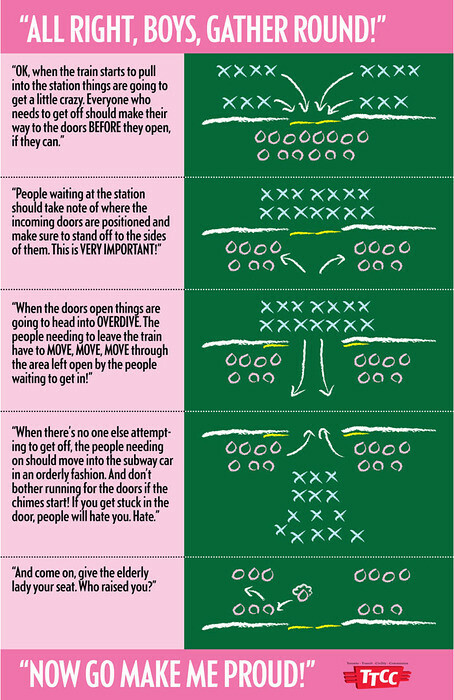 That’s why today’s official TTCC, unofficial TTC poster is about planning for, and managing, your body as a train moves into a station. It may seem obvious, but some people only dimly recall their physics lessons about two objects being unable to occupy the same space at the same time." I wonder how many people have printed it off and stuck it on the subway over there? Do you think we should have similar designs for the Tube? Something like the above would make a great cross platform London Underground ad. The newspaper also ask for readers to send in other "transit peeves/grievances/peevances" for future campaigns and posters. What posters like this do we need on the Tube? I definitely think people should be advised on how to travel with large rucksacks. It's long been a personal bugbear that travellers often forget they have these on their backs on the Tube. Hat tip to Jamillah Knight for discovering this via Chip Zdarsky! 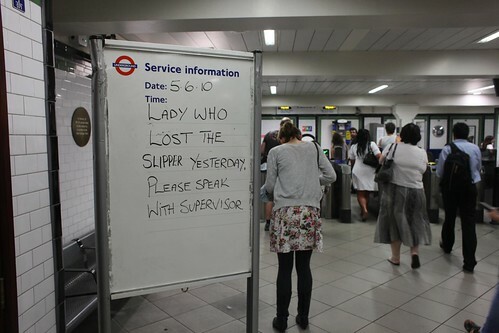 As Matthew said it would have been lovely to have heard this over the Tube public announcement system "Will the lady who lost the slipper yesterday, please speak with the supervisor. Your Prince Charming awaits." Wonder if it fell down the gap?! 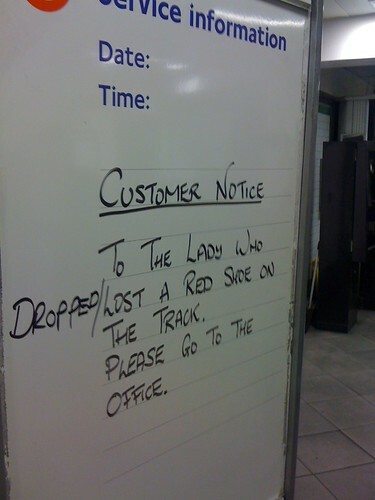 Update - There definitely seems to be a shoe issue at Balham Underground as last night, webponce saw another sign there. He said "First there was Cinderella, now its Dorothy who has lost her footwear at Balham station. Tomorrow, I'm holding out hope for either Rapunzel's wig, a bail of straw left by some Porcine builders, or perhaps a trail of cookie crumbs all the way back to Morden. More importantly, who loses a shoe and doesn't immediately report it?" More than 90 per cent of the RMT voted to strike over the “continued threat to jobs and safe working conditions and in support of a decent pay increase this year”. This follows the end of PPP (public-private partnership) where TfL took control of Tube Lines last month. No date for the strike has been announced as yet. 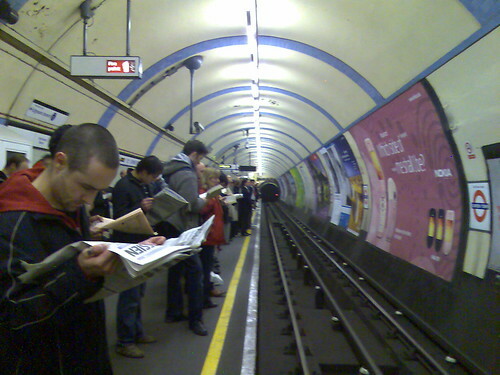 Tube Lines are hoping that talks can avert the strike. A TfL spokesperson said "We have tabled an acceptable pay offer and we remain committed to continuing our negotiations and avert strike action which would cause unnecessary disruption to the travelling public." 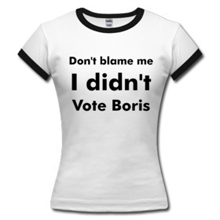 An RMT spokesman told City A.M. that Boris Johnson could have stripped Tube Lines of its contract without buying shares. Shareholders were paid £310m for their equity & workers fear this will lead to delays in upgrades & pay freezes. The RMT believe that shares hadn't been bought the upgrade work could have been carried out at a fraction of the cost. Looks like we're in for a summer of strikes as BT workers unanimously backed a strike ballot over pay after rejecting a two per cent rise. The British Airways cabin crew dispute continues as Unite has increased strike pay for staff on the picket lines, as talks between the two are postponed. Update - Two Tube strike dates in June and July have now been set. 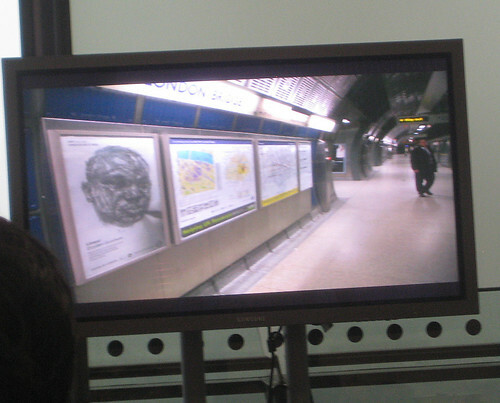 Art on the Underground held an excellent public discussion at City Hall about London Journeys. I went on the spur of the moment and there were some wonderful random nuggets of trivia, art, design and practical information about 'passenger flow'. 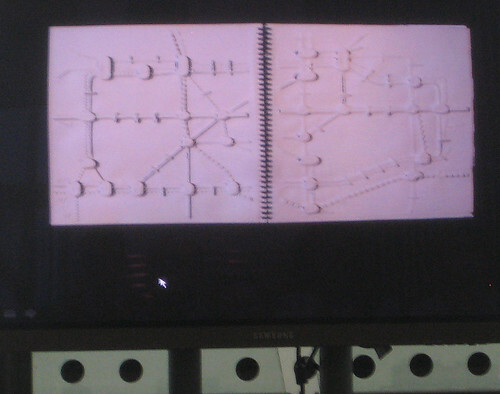 It opened with David Lawrence who looked at the recent history of design on the London Underground. He spent some time discussing the Real Time Sub Group at TfL which carries out research on London Underground announcements & what words aren't allowed. He joked that 'late' and 'delays' weren't permitted, but in reality you'll never hear the words, 'suicide' or 'bomb'. He felt that announcements were overly formal and actually said more than needed to be said. Have a listen when you're next on the Tube, to see if you think he's right. Do we really need so many – 'ladies and gentlemens' and ‘in operations’? Iain Huston from passenger space modelling, followed with an insightful talk on how the London Underground use computerised models to help our journeys. Although you might not think it, Tfl do value our time. In fact they've even measured how various travellers value time. I imagined that Tube commuters thought their time was most valuable. But they only value their time at £8 an hour, whereas a taxi passenger values theirs at a massive £31 an hour. Good levels of service are also measured by how much space a person has to themselves. Your journey is actually perceived as better or faster, if there is less congestion, even if in reality it takes longer to complete. London Underground study people's movement through Tube stations and can work out how to slow things down if certain stations get overly congested. Placement of ticket gates can make a big difference to passenger flow. 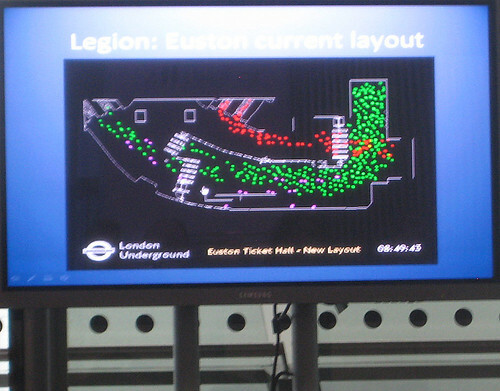 The images below show how the ticket hall layouts at Euston were improved to stop congestion. And the flow afterwards, with less congestion. We learnt that unreasonable behaviour is also taken into account. Tourists going the wrong way, people finding short cuts are all put into the models to work out the best flow. Some stations are lucky as they have more 'trained commuters'. The ticket gates at Bank at the Waterloo & City line are used by 'model commuters' who are amongst the fastest travellers on the system, have their Oyster cards ready in advance, know where the best exits are & walk quickly. 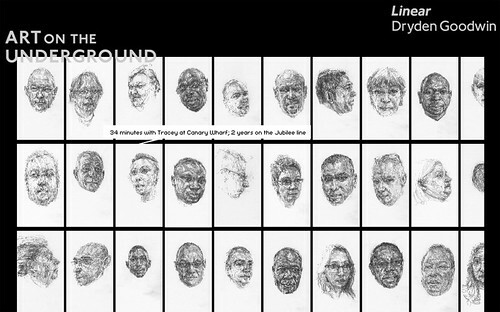 The final part of the talk featured artist Dryden Goodwin whose line drawings of 60 Jubilee Line staff you've probably seen on the network. However, the website has an animated film of Dryden sketching the staff while they chat about their time on the Tube, hobbies, family, music or anything that enters their head at the time. Dryden said 'it was important that something was held back, so you never get to see the real individual being drawn. It's like our attitude to staff on the Tube. They're like furniture. You don't see staff unless you really want or need to'. Check out the stories when you have some spare time. I particularly liked Tracey, who described her experience of holding the hand of a man who'd had a heart attack 'I wanted his family to know that there was someone looking after him. That he didn't just die alone on a crowded platform'. Alone in the crowd. Nice juxtaposition that kind of reflects a lot of people's attitudes of Tube travel. The second part of the series is on Tuesday 8th June at 6.30pm. I've no idea who's speaking but hopefully it will be as varied and surprising as this one. We often have "tweaks" to the London Underground map (some are major changes like the loss & re-emergence of the Thames). 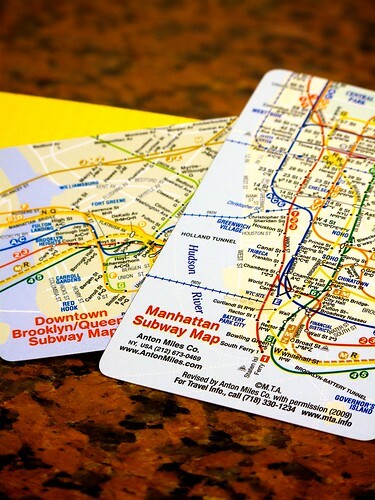 However, the New York subway map is about to have its first overhaul in more than ten years. It's all to do with clarfying Manhattan, which will become bulkier, taller & 30 per cent wider. Like our Tube map, the locals are finding that their subway map has become overcrowded over time. "In its desire to be complete and provide a great deal of information, it took away from some of the clarity you would have with a simpler map," said Jay H. Walder, the Metropolitan Transport Authority’s chairman. Walder felt that service guide which showed the weekend schedule, was theoretical at best. This will be removed along with a growing list of handicapped-accessible stations that had begun to dominate the bottom right corner. 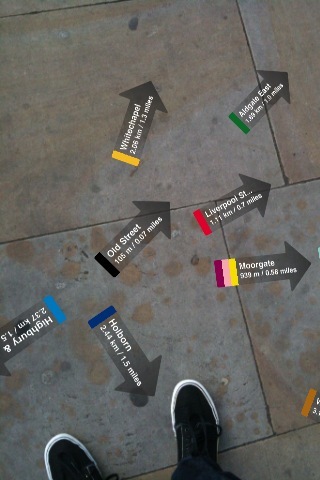 As with our London map small wheelchair symbols will continue to denote those stops. I wonder if TfL were consulted over this project? Map expert Maxwell Roberts has long been arguing that our Tube map has lost its way and needs simplification. He "believes we've now got to the state with the map trying so desperately to please everyone (wheelchair access, station closures, partial station closures, zones, future extensions), that it has become a bit of mess. The network has grown so much that even Harry (or rather Henry) Beck would have tearing out his hair. Now more than ever we can see the tension between the map's need to be legible, usable, attractive and simple and its counter need to convey information. The addition of Cross Rail and the Olympic Line will only make matters worse." 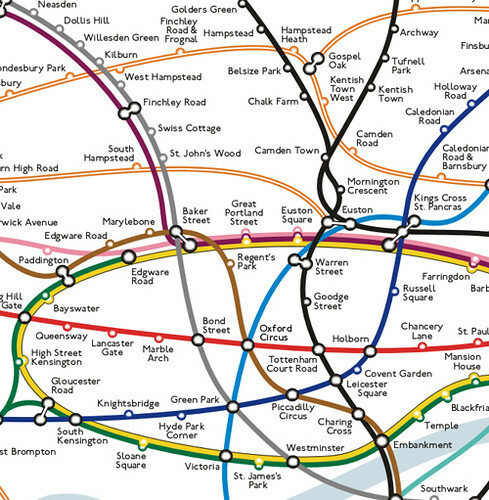 Will there come a time when we see certain parts of London expanded on the Tube map? Will other parts be reduced? How do you balance humanity & familiarity with the complexity of the system? Hat tip to Jemimah Knight for finding this.